The deal of the week from July 6th through July 12th is the Sizzix Big Shot Doctor's Bag! Order the Big Shot Doctor's Bag before July 12th for only $49.99. 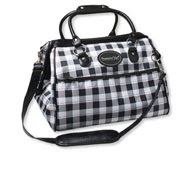 The catalog price of this bag is $69.95. That means you will save almost 30% when you take advantage of this week's special deal. This bag will hold your Big Shot and lots of dies and folders and stamping goodies! Contact me to place your order, or if you have any questions!